With jurors saying they were hopelessly deadlocked, a judge declared a mistrial Friday in the sanity phase of trial of a German national who set more than 40 fires in less than a week in the Southland. 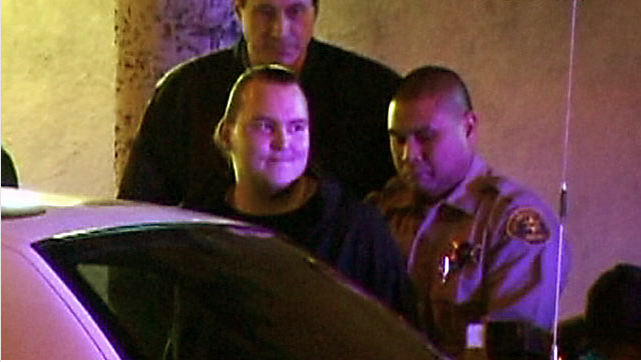 Harry Burkhart, 29, was convicted Sept. 1 of setting the fires in Hollywood, West Hollywood and the San Fernando Valley, but the same jury was unable to reach a verdict on whether he was sane or insane at the time of the crimes in late December 2011 and early December 2012. Eight members of the panel found that Burkhart was insane, and four believed he was sane. The six-man, six-woman panel deliberated about two days in the trial’s sanity phase before sending a second note indicating that it was unable to reach a verdict. Los Angeles Superior Court Judge George G. Lomeli had gotten a similar note Thursday from the jury asking, “What happens if we cannot reach a unanimous agreement?” He responded then that he thought they hadn’t deliberated long enough and believed further deliberations were necessary. At this afternoon’s hearing, the jury’s forewoman said she did not think there was any reasonable probability that the panel would reach a unanimous verdict, with the other 11 jurors saying they felt the same way when they were questioned by the judge. After the judge declared a mistrial, one of the alternate jurors who had not been involved in deliberations asked, “Can you switch us in?” Lomei responded that he could not. Burkhart — who unsuccessfully asked the judge to send him to a psychiatric ward after the jury’s deadlock — is due back in court Oct. 13 for a hearing to determine how to proceed with the case. “The only thing it means is that they failed to prove their defense,” Deputy District Attorney Sean Carney said outside court. Burkhart could have faced nearly 89 years in state prison if jurors found he was sane at the time of the crimes or been sent to a state mental hospital if he was found to have been insane. Burkhart was convicted of 25 counts of arson of property, 18 counts of arson of an inhabited dwelling and two counts each of possession of an incendiary device, attempted arson and arson of a structure. The crimes occurred between Dec. 30, 2011, and Jan. 2, 2012, with a one-day break on New Year’s Day, when no fires were set. Most of the blazes were started under vehicles parked in carports or near homes, but one vehicle was set on fire Dec. 30 in the parking lot of a shopping center in Hollywood and another at a complex nearby on New Year’s Eve. Burkhart’s attorney told jurors that his client is “profoundly mentally impaired,” “seriously mentally ill” and has been diagnosed with autism spectrum disorder. He said Burkhart’s separation from his mother following her arrest in the United States in connection with a criminal case in Germany to him meant the world was coming to an end. He planned to “inflict fear and fire on Los Angeles” after becoming angry that his mother had been arrested, Carney said. The defense has the burden of proof in the sanity phase, with jurors being asked to determine if there is a preponderance of the evidence — rather than proof beyond a reasonable doubt, the standard required in the guilt phase of the trial — to show he was legally insane when he committed the crimes. Burkhart, who has remained jailed since his arrest, listened to the proceedings through a German-language interpreter.